The best model, most popular stand mixer kitchenaid makes. 325-watt mixer with 10 speeds; 5-quart stainless steel bowl. Tilt-back head for easy access to mixture. Includes flat beater, dough hook, and wire whip; pouring shield not included. Measures 14 by 8-2/3 inches by 14 inches. Included accessories: Flat beater, dough hook, wire whip, and power hub. ATTENTION ALL CUSTOMERS: ALL ELECTRONIC ITEMS ARE 110V. 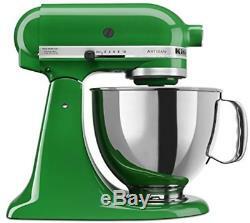 The item "KitchenAid Stand Mixer tilt 5-QT RRK150CG REFURBISHED Canopy Green" is in sale since Friday, August 31, 2018. This item is in the category "Home & Garden\Kitchen, Dining & Bar\Small Kitchen Appliances\Countertop Mixers". The seller is "usa-world-sales" and is located in Los Angeles, California. This item can be shipped to United States, Canada, United Kingdom, Denmark, Romania, Slovakia, Bulgaria, Czech republic, Finland, Hungary, Latvia, Lithuania, Malta, Estonia, Australia, Greece, Portugal, Cyprus, Slovenia, Japan, China, Sweden, South Korea, Indonesia, Taiwan, Thailand, Belgium, France, Hong Kong, Ireland, Netherlands, Poland, Spain, Italy, Germany, Austria, Israel, Mexico, New Zealand, Philippines, Singapore, Switzerland, Norway, Saudi arabia, Ukraine, United arab emirates, Qatar, Kuwait, Bahrain, Croatia, Malaysia, Bahamas, Uruguay, Antigua and barbuda, Aruba, Belize, Dominica, Grenada, Saint kitts and nevis, Saint lucia, Barbados, Bermuda, Brunei darussalam, Bolivia, Egypt, Guadeloupe, Iceland, Jordan, Cambodia, Cayman islands, Sri lanka, Luxembourg, Maldives, Nicaragua, Oman, Pakistan, Paraguay.